Euro Cup 2012 began a few days ago. For those of you who aren’t fans of “the real” football (unfortunately referred to as “soccer” in the States), I must say, you’re missing out. When I was younger, I used to think football was boring, what with the final scores always being so low, and many times even non-existent. Then I met Ryan, an avid FC Barcelona fan. After watching my first Barça match, I was sold. I truly believe that if I was introduced to the sport by watching any other team, I would not have been instantly hooked. Since then, together we’ve watched every single Barcelona game of every season, and I’m inevitably just as loud and riled up as, if not more than, Ryan. I’m not going to get into the amazing talent and teamwork and glory that is FC Barcelona, because that could make for a never-ending post in itself. Besides, regardless of if you’re a fan of Barcelona or not, the statistics speak for themselves. Best team in the world. ‘Nuff said. 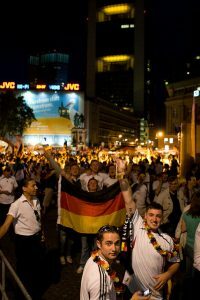 Anyhow…Saturday night was the Germany v. Portugal match at Euro 2012. You could feel it in the air all day. 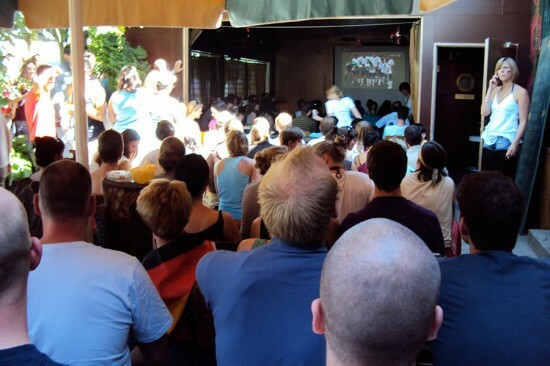 Every – and I mean every – bar, café, restaurant, bodega, and public gathering place in Berlin had multiple, large, flat-screen TVs set up for the game, both inside and outside their establishments. We first noticed a couple of them during our morning walk with the dog. As the day progressed, more TVs started popping up. By our evening dog-walk, every single place we passed was ready to show the game. We’d been invited to a game/birthday party at Mauersegler, normally a chill hangout spot at Mauer Park in Berlin. We showed up about half-hour into the game, and the place was a sardine can. I counted five screens showing the game, and it was beyond standing-room only. People were even gathered outside the fence, watching what they could through the crowd. We grabbed a beer as we searched for the birthday girl, and caught what we could of the game. When we realized that I had forgotten to bring the handy (a.k.a. mobile/cell phone), and that there was no way we were going to be able to find her in this sea of people, we decided to head back home. Just as we were walking out, the entire city exploded in cheer. Fireworks started going off all around, cars driving down the street started honking their horns, and everyone was joyfully shouting. We ran back in to catch the replay – Mario Gomez had just scored for Germany with a nasty header. (Yes, you read that right – a German player named Mario Gomez – born of a German mother and a Spanish father, he was raised in Germany.) I have to say, we found it extremely entertaining to listen to a massive crowd of Germans chanting, “Gomez! Gomez!” Maybe you had to be there to appreciate the humor in that. I have to admit that I will most certainly miss this life I’ve grown to love in Berlin, as it has been my first long-term experience of living outside of the States. Nearing the end of this chapter of my life, I realize that I’ve learned so much this past year. Most importantly, I’ve learned a lot about myself, about removing myself from my comfort zones, about getting out there and living life, and embracing every moment – the good and the bad. As much as I’ll always have a soft spot in my heart for Berlin, I leave it with a head full of great memories, ready to move on. I’m ready to see, smell, taste, hear, and embrace all that the rest of the world has yet to teach me. The video’s great, Ang! I remember being in Ireland and Scotland during the World Cup. What an experience! It really consumes the population! Thanks, ma! It really does consume the population. It’s really such an awesome feeling – “awesome” in its true meaning. It’s a good thing we love football! We’re in the right place for it!